Well, it's been a while since the last post. 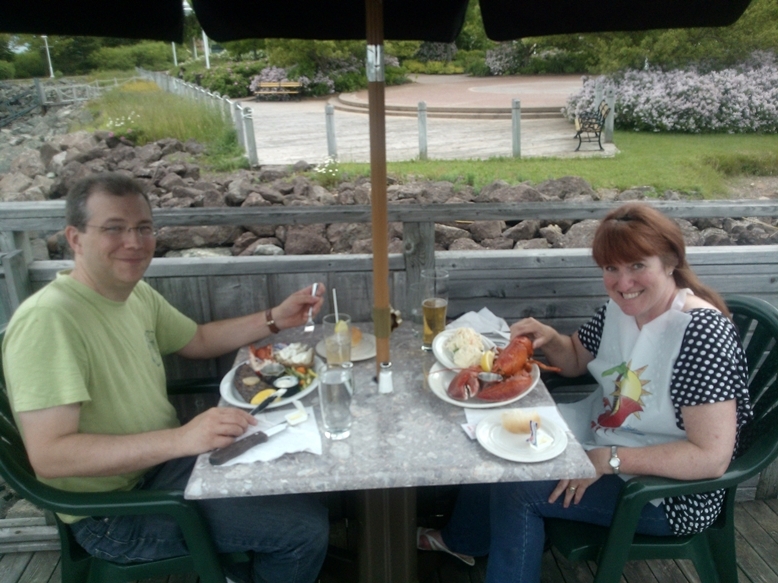 But I'm happy to report that I finally enjoyed my first PEI lobster. I've been holding off and waiting until Todd was here to share the experience, so a day after his arrival we stopped in to a touristy restaurant on the wharf in Charlottetown. We had our celebratory lobster dinner there thanks to a farewell gift from a neighbor back home. Thanks Bill and Lorraine! Of course, being a tourist spot it was overpriced and we have since been clued in to the more reasonable places that the locals use. But as you can see from our smiles, we were just happy to have that first taste of lobster, and the long wait only made it sweeter. So much to do here to get settled in and get the unruly gardens under control. Working a job that has a shift schedule opposite to one's spouse really wreaks havoc on one's ability to get things done! But all that will change soon...more on that later. First of all, Todd started work and has been chipping away at the grass little by little. 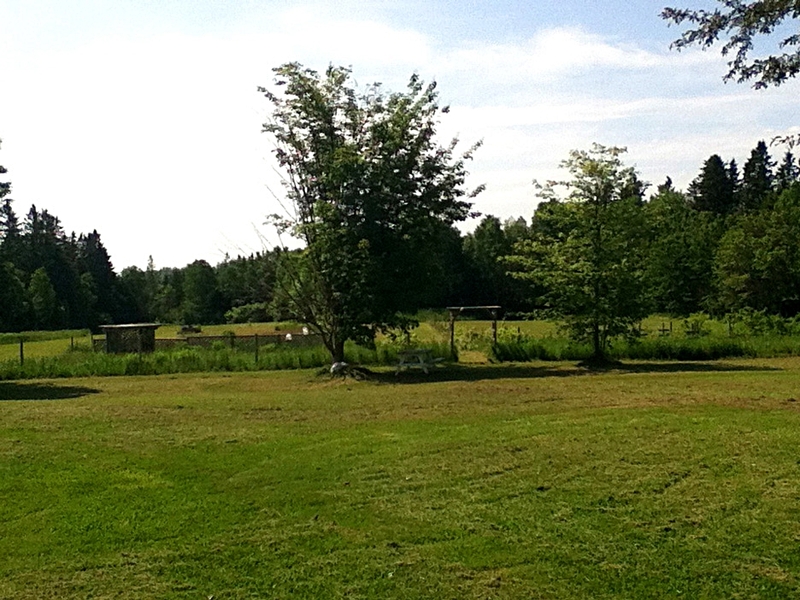 He managed to get his cutting time down to about 5 hours on the riding mower. That's a lot of grass! I have to keep reminding him that as time goes by and we add outbuildings and such, the amount of grass to cut will diminish. In the meantime it's a two day event to cut the lawn. By now he is realizing that he shouldn't have been complaining back in Ontario when it only took him forty minutes to cut the lawn. This past week was a busy week with the arrival of house guests who stayed for the week. My friend Pam, her husband, stepdaughter and newly acquired hound, Rover. Rover is a big dog who is a friendly, gentle dog. However, the cats were none too happy to see him invading their property. Every effort was made to keep them all separate with closed doors and timed treks through the house but now and then they'd come eye to eye and the cats would fluff up like a couple of puffer fish just before they high tailed it for some obscure hiding spot. Rover never quite understood the big deal. He enjoyed his stay, and the romps on the beach. Though he probably rued the last two days during which he battled a bad case of the trots after he took off sans leash on the beach, and at some point quenched his thirst with a whole lot of salt water. Pam loves to garden so we took full advantage of her expertise to help us figure out what we could cut down/pull out in the garden and what was to stay. Thanks to her help, Todd was able to get the garden almost fully tamed. It went from wild, overgrown, waist height grass and weeds to something we could actually tend and make use of. 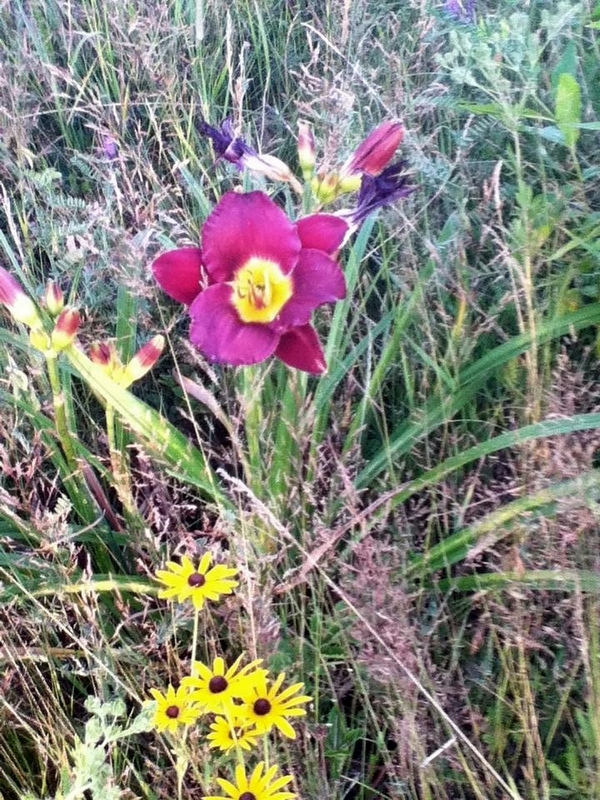 We not only uncovered a number of plants we didn't know about, but found a lot of flowers that had once been planted there. Blue asters and a lovely two colored iris. But the best discovery of all was the to finally find all the fruit that we knew was planted out there. The dwarf apple trees are simply laden with tiny apples waiting to mature for the fall harvest. I'm going to be mighty busy picking all those apples and will have to make a lot of sauce, pie filling and whatever to preserve them all. The blackberry bushes are so full of berries I don't know how I'm going to get them all picked. I have a little time to figure that out because it will be a week or two before they are ready. Same goes for the raspberries. The Lingon berries aren't visible yet. 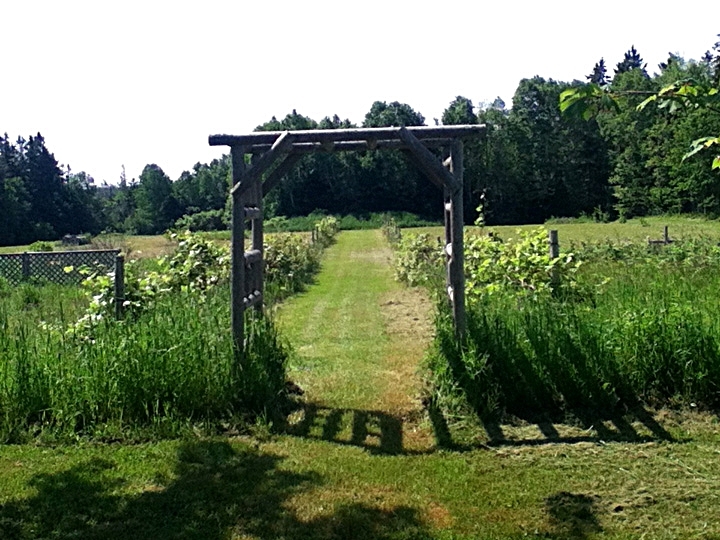 But the grape vines which line the path down the middle of the garden (see image above) are just loaded with grapes which are also on their way to maturing for harvest. There are three kinds of grapes out there, although I'm not entirely sure what kind they are. 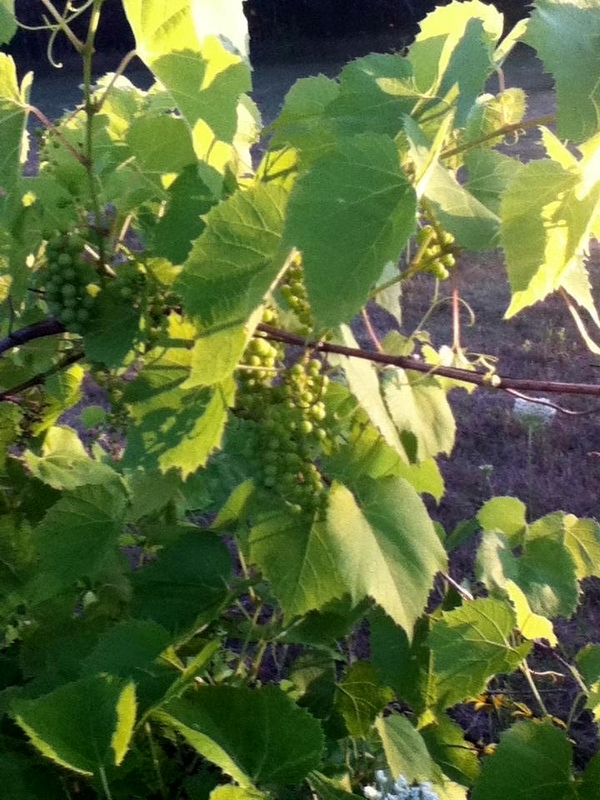 But it seems we'll be making some grape jelly or wine or both. Woohoo! 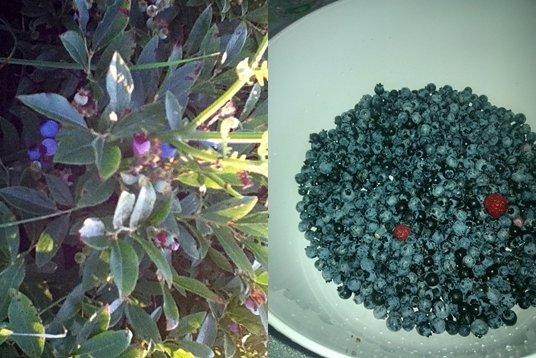 Then there's the low bush blueberries that are proliferating on the property and they have been ripe and ready for a week now. We've been picking them every other day just trying to keep up. Picking them is time consuming since they are so small but, oh my! they are tasty! I haven't put any away because we seem to be eating them as fast as we harvest them. I've come to realize that maintaining a very large productive food garden is going to be the equivalent of a full time job. Just harvesting the fruit will be busy enough. Next year when we have planted vegetables it will be a challenge to keep up with it all. But we will figure out a way! And we have been trying to fully appreciate our surroundings whenever we have been able. Walks through our property to discover that at the edge of our woods is the remnants of an old apple orchard. The trees are being a little choked out by the evergreens but there are lots of apples on those trees as well. The trick will be harvesting them while fighting off the mosquitoes. Okay, this place has been close to a paradise but every ointment has a fly in it somewhere and quite literally flies it is! The black flies and mosquitoes make it a real challenge to enjoy the property but we are told the season is coming to an end soon. Of course, if you really want to get away from the bugs there is always the beach. Not on the beach of course..the horse flies or whatever they are will get you there too. We have discovered you need to walk out into the water about mid thigh and just stand there...the hungry bugs don't seem to want to follow out that far. Standing in the water with the gentle swells that roll into the beach is quite relaxing....just keep an eye out for the jelly fish. They have been washing up on shore en mass lately. I haven't had a bad encounter yet, but Pam's husband did have one brush up against his leg and left him with a little bit of a tingly sensation like a thistle brushing against your skin. Not too bad he says. Todd discovered that by bicycle the beach is only a ten minute ride away (2 minutes by car). So we are on the lookout for a second hand bicycle for me so we can ride to the beach with a picnic lunch one day. As for the job, the time has come to step up to the next challenge. The goal we had moving here was to be self sufficient and provide for ourselves as much as possible. And that includes making our own income. At the moment, two full time jobs are keeping us so busy there is little time for the garden or unpacking and renovating an old house. Just making the move here was a huge challenge but it was only the first step. Time now for the next challenge. A recent outing to an ocean side tourist town inspired us to make a leap of faith. I've decided to open a tea shop! It seems that here also, loose leaf teas have become quite popular. And so I plan to jump on the bandwagon and open a small loose leaf tea shop which will be the only one in this area. My idea has been met with lots of enthusiasm from potential customers, so I hope this venture will provide me with an adequate living. It's going to take a little time to pull it all together and hopefully this next chapter in our adventure is successful. For the moment I have one more week of night shift work and then there will be two weeks of crazed cleaning and unpacking to get us finally from chaos to organization. After that it's Time for Tea. And that folks, is the name of my future tea shop. Wish me luck! Wow so many things all at once and it all sounds sooooo good! I do wish you the very best of luck! You have done amazingly well! I'm so happy for you!